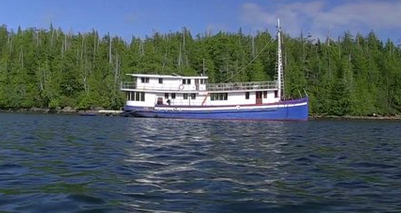 Moored in a spectacular bay in the heart of Clayoquot Sound, the InnChanter can be found at Hotsprings Cove, a short boat or plane ride north of Tofino, British Columbia. Enjoy a romantic soak in one of the best hot-springs on the planet while staying aboard the InnChanter. Luxury accommodation and gourmet meals in a setting normally reserved for tent and campfire food. InnChanter is a heritage vessel built in the 1920’s and refitted to take you back to the style and class of the era of her creation. Five staterooms, each uniquely crafted, a main salon with wood burning fireplace, a library for quiet time or a rousing game of chess, rear dining salon with fireplace, a 700 square foot sundeck, and an onboard chef to provide fabulous meals every day. A perfect refuge for your hot-springs get-away. *Our prices include Dinner, Bed & Breakfast.